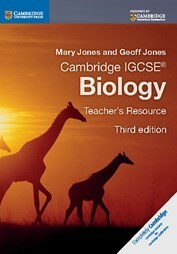 Written by an experienced teacher and examiner, Cambridge IGCSE Biology Teacher's Resource CD-ROM is designed to support teachers in using the Coursebook and Workbook to deliver the syllabus. Teaching ideas for each individual topic give suggestions for the lesson as well as homework and point out common misconceptions. A collection of worksheets is provided for use in class or for students' individual study, with answers provided. Answers to the exercises in the Workbook are also included. Mac users please note that CD-ROMS don't autostart when used with Macs they will need to be started manually. If you have any queries please visit our customer support page or contact customer services.